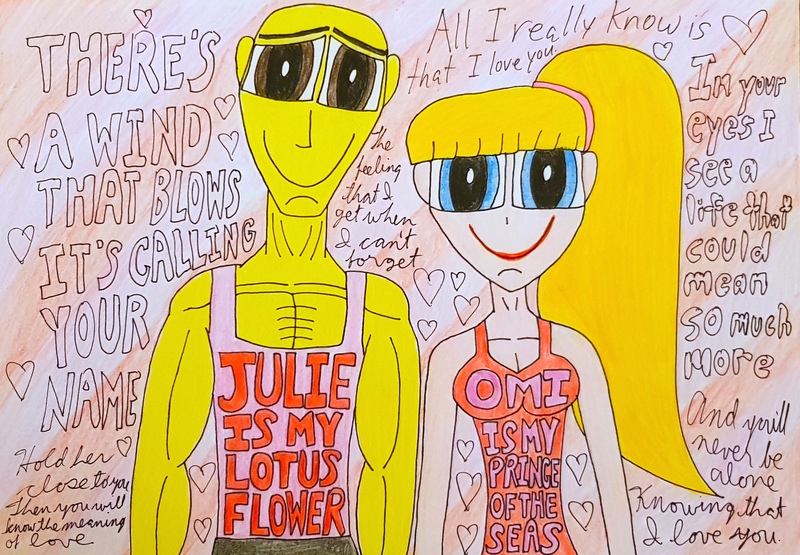 This piece of JulOmi fanart, which is part of Kaitlyn’s aka KatyGorl’s Claim a PPG Pairing Month, is dedicated to HaleysComett and Joshua Orro aka JoshuaOrro who celebrated their birthdays a few days ago. So, Haley, Josh, I hope you guys had amazing, awesome, thrilling, and terrific birthdays. I wish you prosperity, love, and joy in everything you do as artists. Since Prinack or Jack Spicer x Princess Morbucks has become such an item thanks to the ever-fabulous Selena aka PrincessCallyie, I figured why not pair up Omi from Xiaolin Showdown with Julie Smith from The Powerpuff Girls? In my mind, I always thought they would make such an adorable couple, what with Omi’s impulsiveness and simple way of life meshing up so well with Julie’s outer cuteness and occasional inner cattiness. I have the results are more than satisfactory and JulOmi is definitely a crossover OTP that is much a keeper as Prinack. So, here we have the 25-year-old Omi being so cuddly with the 24-year-old Julie Smith. And yes, in my headcanon, these two are happily married. I did mention that while Princess and Julie were in China, Princess fell for Jack while Julie Smith had a major crush on Omi. This crush eventually blossomed into a full-fledged romance between the Xiaolin monk of water with the doll-like, adorable youngest Smith daughter. And voila, a very cute couple for the ages. I figured that to heighten the cuddliness and love present between Omi and Julie, I thought that the Andrea Bocelli-composed song “Someone Like You” would be a most ideal fit for this couple. I hope you enjoy listening to this love song as much as you enjoy gazing at the sweetness and cuteness that is Omi x Julie Smith. I hope you all enjoyed this and I will see you all in the next submission. Omi from Xiaolin Showdown belongs to Christy Hui and Kids’ WB. Julie Smith from The Powerpuff Girls belongs to Craig McCracken and Cartoon Network.